Wow. It is already March, which really shouldn’t be too hard to believe with our noticeable lack of snow this winter of 2014 -2015. 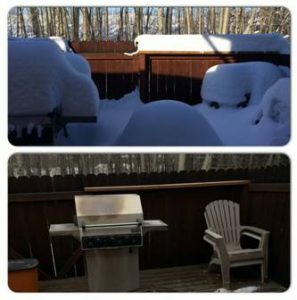 In fact, what a difference a year makes as evidence by my deck below – the top photo was taken on March 15, 2014 and the bottom taken on March 15, 2015. Even more unusual, my deck looked like the bottom photo in mid-February as well! But forget about a year, the next month is going to be an especially busy one for Women Police of Alaska. First of all – we have our biennial elections to be accomplished by April 20, 2015, the date of our next Biannual General Membership meeting at the Glacier Brewhouse at noon in Anchorage on the first day of the Alaska Peace Officers Association 2015 Crime Conference. I plan to send balloting out around April 10, but first, I need to hear from those interested in running for the board, or nominations – all positions are up for election including my position – President (I will remain on the board as Past-President). If I don’t hear from you, you may be hearing from me! Second, the 6th annual Women in Law Enforcement Recruitment Fair in October of 2014 was such a success, UAA Career Services and the Alaska State Troopers would like to have a spring fair, we can call it the 6 ½ Annual Women in LE Recruitment Fair, on April 15, 2015 in the Student Union at the University of Alaska Anchorage from 9:00 am to 3:00 pm. Here is a link to the blog from our 6th Annual Fair in October: http://uaajusticecenter.blogspot.com/2014/11/a-look-at-6th-annual-women-in-law.html. And third, during the 55th Annual APOA Crime Conference, which will be held at the Anchorage Sheraton from April 20-24, 2015, Women Police of Alaska will be hosting a silent auction during the Thursday, April 23, evening banquet and wine-tasting event. The proceeds, as in past years, will go towards our scholarship fund in hopes that we can fund a scholarship for 2015-2106. I’m looking for both donated items to auction, or ideas for to whom I can grovel (I will do the groveling) for donations. Even if you are not attending the APOA conference, all WPA members are invited to attend the wine-tasting / silent auction event and I hope many of you will. 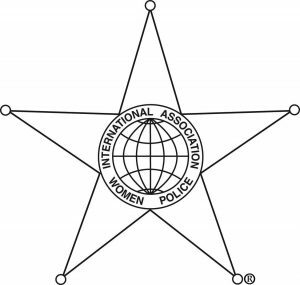 And while I am on the subject of the APOA Crime Conference, at our December 3, 2014 WPA membership meeting, we passed a motion to sponsor a WPA member to 2015 APOA Crime Conference in Anchorage. That is, we will cover the full conference fee – free, complimentary – better than a Groupon. The full conference includes all training, events, door prize opportunities, meals and snacks. Send me an email at michele.logan@womenpoliceofalaska.org if you are interested. If we have several who are interested, we will do something creative like cast lots to see who attends! You will be hearing from me again sooner than you think. In the meantime, stay safe!